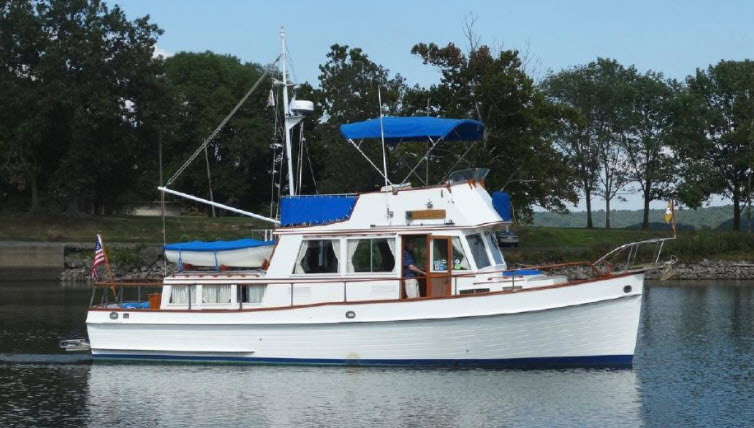 The Katy Leigh, our 36 ft, 1981 Grand Banks trawler was sold on December 1, 2017, The new home is in Panama City and the owner is a very nice man, James, that farmed and built homes in north Florida for many years. A widower, Katy Leigh is now his full time home. He has kept the name and delights in telling friends he has a new girl friend, Katy Leigh. He made a good decision on the name as there is no other registered boat in the USA with that name. Selling the boat took 14 months. We clearned it all up, removed 17 years of our stuff, took lots of photos, and moved it from Kenlake Marina to Eddy Creek Marina in October 2016. The new owners at Kenlake seemed to think they were entitled to a percentage of the sale price. I wanted no part of that and Eddy Creek had no such rule. I signed up Nashville Yacht Brokers to handle the sale. This was a good decision. David Benson stuck with the sales job until it closed and earned his commission. In the end he also represented the buyer so there was no spliting of of the commission.. We created a website on Yachtworld and soon had calls. The biggest problem we had was keeping the outside cleaned up. The thousands of spiders resident under the roof just crawl and crap all over and make a big ugly mess. One potential buyer from Minnesota used to have a Grand Banks and wanted to get another one. He asked see photos of every crack, a missing paint chip, and smoke stain on any ceilings, a total of 127 photos. After we put all that together for him he declined to come an see the boat. I guess he didn't realize this was a 36 year old boat or pay attention to the $32,000 Awlgrip paint job on hull and superstructure. We had an offer from a St. Louis buyer that we accepted. He insisted that a suveyor from Green Turtle Bay would do the survey. Unfortunately this particular surveyor had been banned from performing surveys at Green Turtle Bay. It meant we would have to reposition the boat at Sunset Harbor Hill about 30 miles south from Green Turtle Bay. In addition the new owner would have to take the boat by water to St. Louis. Trucking it is out of the question as it means removing the flybridge. The buyer gave up and cancelled his offer. Things started jumping in September after we reduced the price and we had 3 buyers lined up in early November. One of the rules in boat selling is accept the first offer, don't attempt to play one offer against another, or you may lose both. We made a counter offer and it was accespted by the buyer. We then had to have a survey and sea trial. Mavis and I spent one last night aboard checking out the heat and plumbing. The next morning tI rode with the boat while the sea trial took place as the boat was moved to Green Turtle Bay. Mavis drove up in our car. The surveyor, Bill Rottgering, was impressed with the boat and James accepted the survey subject to a small adjustment in the price.. We used a transient slip at Green Turtle Bay for two weeks while all the paper work was put together. The closing was on Friday Dec 1 and the boat left for Florida on Monday Dec 4th. I had thought I would accompany James to Pickwick Lake but by then I was a wreck with stress induced optical shingles and gave up the idea. James had a good friend with a captain's license and the two of them travelled for less than 3 weeks and made it to Panama city without any incidents at all. Katy Leigh lived up to her reputation of reliable day-after-day travel at 8.5 mph.